PaintScratch sells Hyundai Nexo touch up paint for the years listed in the table. Click your Hyundai Nexo year to see available touch up paint colors. We guarantee Hyundai Nexo touch up paint will match the original factory color chip on Hyundai’s manufactured after 1985. Order Hyundai Nexo paint pens, brush cap bottles, and spray cans from our secure online store. For small Nexo scratches, the paint pen works well. For slightly larger Hyundai Nexo scratches and chips, a brush bottle is best. For larger paint repairs, a Hyundai Nexo spray paint can will deliver best results. Touch Up Paint Videos - Watch and learn how to apply touch up paint to your Hyundai Nexo. How To Apply Touch Up Paint - Detailed instructions for using automotive paint on your Hyundai Nexo. Hyundai color codes are relatively easy to find as they are normally on the drivers door jamb. Some Hyundai models do manage to hide their color codes in the engine compartment so if it is not on the drivers door jamb, you have your work cut out for you. 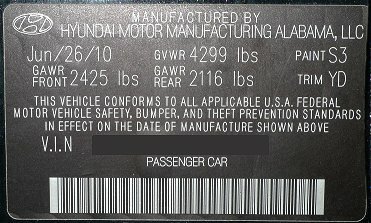 Example Hyundai Color Code: The following image is what a Hyundai color ID tag typically looks like. In the example above, the color code is "S3". Hyundai color codes usually contain both numbers and letters and are two digits long. They will look something like 3E. Some later Hyundais use a three character code composed of letters and numbers. A sample Hyundai color ID plate would look like the picture shown below. Notice the Paint Code is S3. This is actually the same as S3B so even Hyundai can make it a bit confusing sometimes. Hyundai, like all manufacturers, uses the exact same color across many models and then will have a different color name for each model. It's the same paint! This is why the color code is so important to order the correct paint. For example, 3E, above we call Blue Onyx Metallic Clearcoat. It could also be called Blue Clearcoat, Ocean Blue Clearcoat, etc. depending on what the marketing department decided to call it.